Teacher Dude's Grill and BBQ: ERT - Greek government embroiled in very public showdown with state run broadcaster. ERT - Greek government embroiled in very public showdown with state run broadcaster. Sitting in the foyer of the ET3 studios, now being occupied by its own journalists and technicians the strangest thought crossed my mind; those who were part of the groups protecting the building included some of the station's most bitter opponents. The same people that have been so critical of the willingness of public broadcasters to toe the government line and allow politicians such a free hand in domestic affair were now willing to stay there day and night and risk injury in the event of a riot police raid. The irony of the situation was not lost on them. The sudden decision by the Samaras government to shut down ERT on Tuesday took even insiders by surprise, no one I talked to, be they journalists or political activists had expected that such a move would happen so quickly. That the government was looking to subject ERT to the same kinds of cuts as suffered by other areas of the public sector was obvious but the swiftness of the closure left everyone wondering what was really behind the action. However, no one in the government, I suspect realised the the scale and determination of the reaction both from within Greece and abroad. 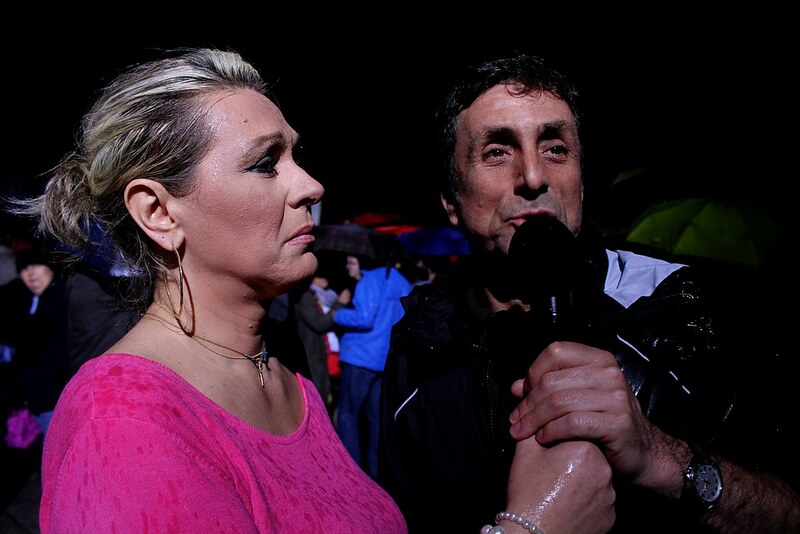 Within hours technicians and journalists had stopped normal programming and were providing news and updates of the situation within the studios and suddenly, most miraculously of all, reporting on what was happening and not what they been told by the government party leadership to cover. 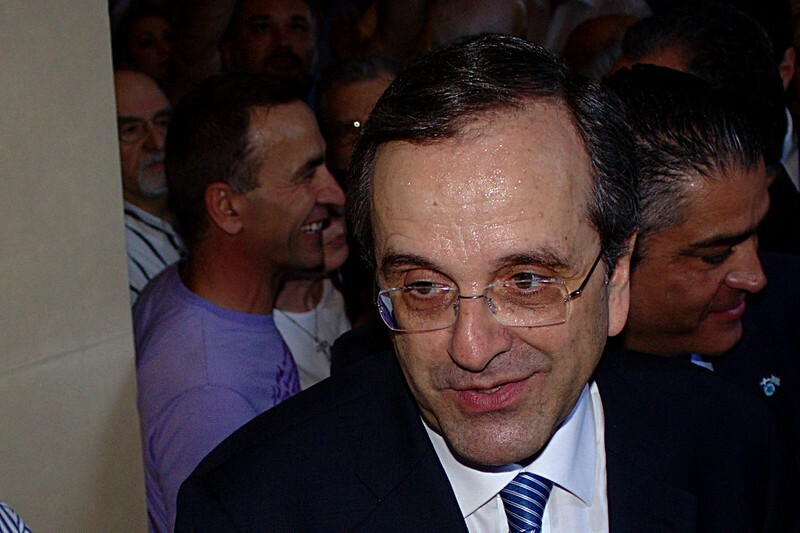 It was this change in reporting which most probably prompted the Greek prime minister, Antonis Samaras's decision to send in the riot police to shut down transmission facilities across the country and the privately run DIGEA service to threaten other TV channels when they attempted to re-broadcast ERT's signal. The idea of journalists who has been privy to so many of the back room deals, dirty political tricks and acts of censorship going public with their knowledge must have terrified politicians used to always getting their way whenever they appeared on the state run channels. For many older Greeks the announcement by NET TV presenter that the riot police were on the move followed by a black screen brought back memories of the Regime of the Colonels that ruled the country with iron fist from 1967 to 1974. Like Spain, and Portugal the experience of living under a dictatorship is still a vivid part of Greek popular memory and not simply a footnote is a school history book. Unlike the 1970's the shutting down of the ERT signal has proved more problematic and technician have defied the crackdown using internet broadcasting, satellite signals (provided by the European Broadcasting Union) and resurrected analogue frequencies to ensure that NET in Athens and ET3 in Thessaloniki are still on the air. 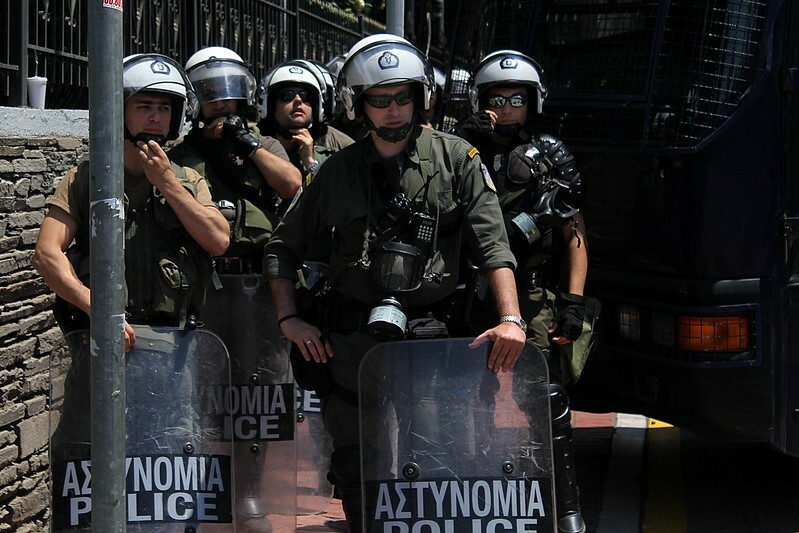 In its turn the authorities have tried to thwart these moves, shutting off telephone and internet connections to ERT facilities and in many parts of Athens and Thessaloniki, platoons of riot police have been stationed just a few hundred metres from ERT facilities. 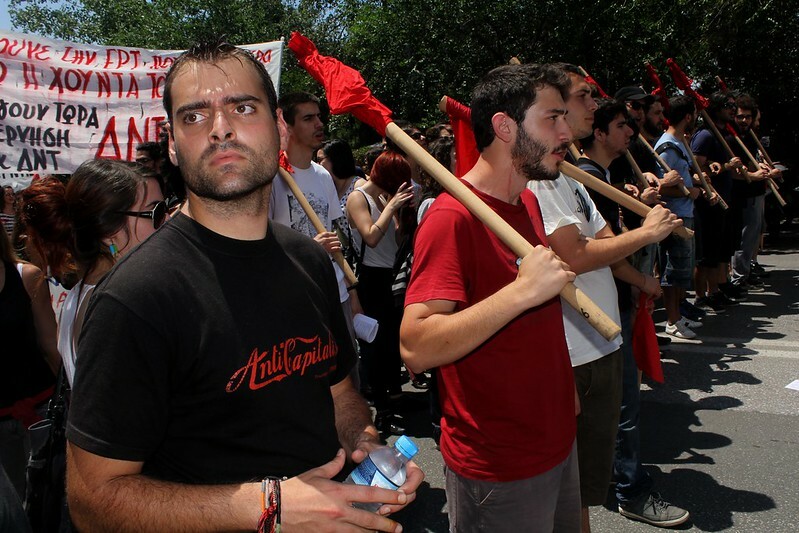 As many Greek Twitter users repeatedly wrote; support of ERT was about defending democracy and not the status quo, so even groups opposed to the idea of a state run broadcaster were willing to stand shoulder to shoulder with sacked journalists in the demonstrations, marches and concerts that have been taken place in Athens, Thessaloniki and other Greek cities over the last five days. The reason and timing behind the ERT closure has been a source of speculation for many political analysts in the media and beyond. For some the closure was a diversionary tactic designed to draw attention from the failure of the Greek - Russia GAZPROM deal that the prime minister had hailed as a "success story".. For others the move is the opening shot in a new round of elections that will allow New Democracy to dump both PASOK and Democratic Left coalition partners who are both doing badly in the polls in order to form a new government that will allow them top act more freely. For what It's worth I believe that the closure of ERT is a political gamble by Samaras, who sees it as a way to kill several bird with one stone. In firing 2,600 public employees in such a swift and dramatic manner he thinks that he'll win point abroad with the Troika (ECB, EU and IMF) who have repeatedly criticised Greece for dragging its feet over public sector reforms. Domestically, Samaras feels he can still sell the idea that he is a bold reformer taking on a corrupt, wasteful public organisation that is a burden to the tax payer. And finally, the the loss of so many media outlets will play well with the local oligarchs, upon whose support he relies upon more and more. Their own media wings are hemorrhaging cash as the economy continues to shrink and ad money dries up. However, the gamble may not have paid off, international reactions from have been far greater and far more critical than Athens had probably expected and even local popular support for ERT is much higher than Samaras had anticipated, with 65% of those questioned in recent VPRC poll saying they disagreed with the decision to shut down the broadcaster. So what happens next? Hard to say, on the one hand the PM has acknowledged that the loss of the so many stations was hasty and has offered to re-instate a limited number of ERT employees to run a skeleton service yet in this mornings speech he vowed to shut down the public broadcaster. As with so many aspectsof current Greek political policy decisions change from day to day, with political opportunism being more of a guide than any grand plan or ideology. More on this story via Asteris Masouras at Global Voices.